With New York Fashion Week near its end and Fashion’s Night Out having come and gone, you may feel lost as to what to do next. Well, we here at Style Files have just the event for you. Yes, it includes fashion and yes, it certainly includes shopping… and I for one may do a whole lot of it. Ted Baker London, one of the fastest-growing lifestyle brands in the UK, is having an all out fashion bash right here in Scottsdale, Arizona. 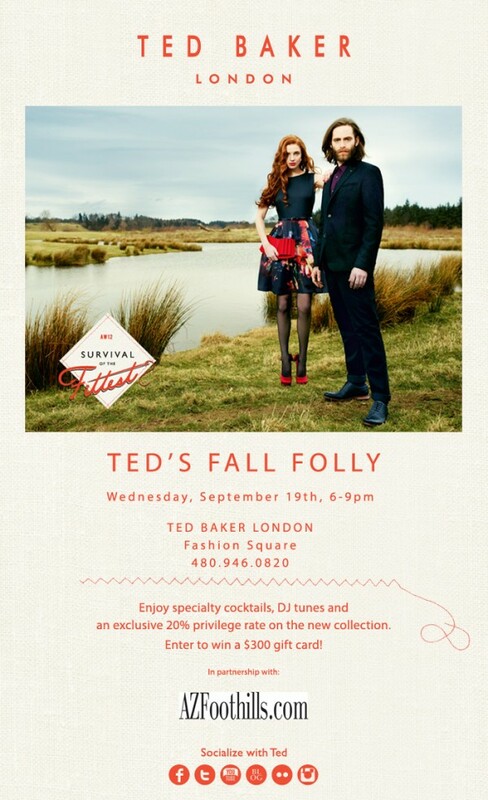 Join Arizona Foothills as we partner with Ted Baker for Ted’s Fall Folly on Wednesday, September 19th where you’ll enjoy a 20% privilege rate on their newest collection. And of course the night wouldn’t be complete without specialty cocktails, DJ tunes, a chance to enter to win a $300 gift card, and your girlfriends or beau! 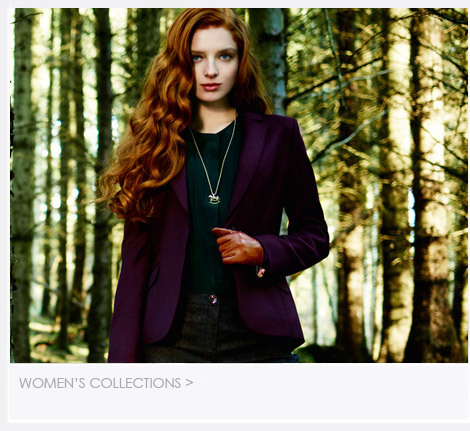 We even have a little sneak preview of the styles you’ll find and surely have to own. Which the lovelies at Ted Baker desecribe for us as a collection that brings good old-fashioned glamour and contemporary femininity together. For A/W12, Ted’s offering signature prints inspired by botanical vintage finds, tailoring with a natural influence plus clean lines and bold colours to create the perfect mix of style and modernity. We are excited about this Anegal peplum detail sweater. You get the best of both worlds: style and comfort. It’s the perfect top for a cozy dinner at a mountainside café (Colorado anyone?). If you have been paying close attention the runways over the last few seasons then you know that yellow is here to stay. And Ted Baker does an exquisite job with this Edella embellished collar dress. Certainly a dress for all seasons… and for this season pair with black opaque tights and a blazer. Speaking of yellow, my absolute favorite pairing is this drool-worthy cape and floral-print dress combo. If this is what being at one with nature is all about then sign me up for the next nature walk! Ted Baker is doing a fine job at staying on trend with their deep wine flannel suit jacket—I’m not sure about you but I witnessed a plethora of collegiate trends happening at Fashion’s Night Out. Pair with a white button-up and a navy pull over and you are all set to get fashionably educated (or at least look like you are). I am positive that you are just as excited as I am to attend this fabulous event. So here are all the details you need to arrive at the hottest shopping event of the season… Hope to see you there!